I recently gave an enthusiastic review of The Goodness of Honey. This is one of the recipes that struck my eye on the first pass through the book. A lovely salad with turkey, avocado and tomatoes topped with a Mediterranean-style dressing of yogurt, mint and lemon juice. The turkey is cooked with honey but you can double down and add a bit of honey to the dressing, too. After all, it’s honey. And honey is really good for you. Just check out The Goodness of Honey and you’ll be convinced! Preheat the grill to high. Place the asparagus on a baking tray and season well. Cook under the grill until tender, about 5 minutes. Leave the grill on for the turkey. Mix the honey and soy sauce together and pour it over the turkey breast. Grill the turkey for 8 minutes on each side. For the dressing, combine the yogurt, mint and lemon juice together and season well. 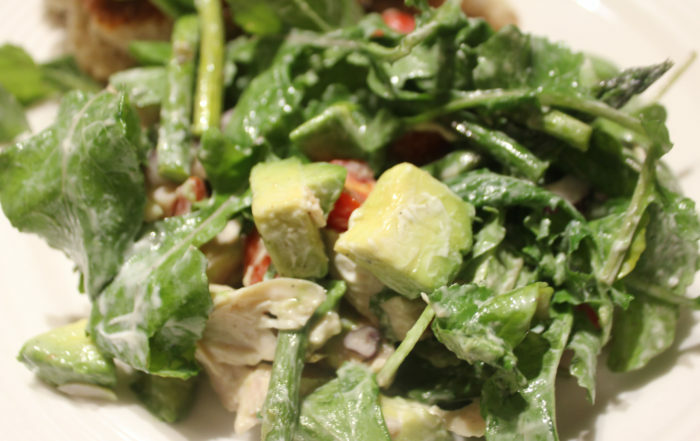 To serve, divide the asparagus, watercress, tomatoes and avocado between two plates, top with the sliced turkey and drizzle over the dressing.